sohocool and TIMisthebest like this. Thanks a lot for interesting indicators. Some people know to use these indexes especially Usd. Other people trying to make dummy indicators. But banks, big trading companies, especially goverment use these indexes. UDX is the real strenght of USD. Just think about; how can u compare currencies except the currences in the formula? Fx is curreny trading platform. The big curreny is USD. Other ones trying to fight with it. This tool measures major currency strength in the form of percentage & meter. Besides that it also able to show strength of oil and gold, U.S stock indices and Europe stock indices. Below of the board display 27 currency pairs weak or strong movement, bid price and range. From the input parameters we can adjust open/close time for the stock indices market. To display the stock indices you have to open it with meta editor, insert the symbol your broker offer. This tool is intended for intermarket analysis of financial market. It was created to be used with Broco trader Mt4 which have many stock indices but unfortunately Brocompany was closed down few years ago. ON the other hand there are many commercial tools available which is more advance than this free tool. levonisyas and sameermehta74 like this. What would be the formula for AUD Index? i have no idea but i'll search it for u. 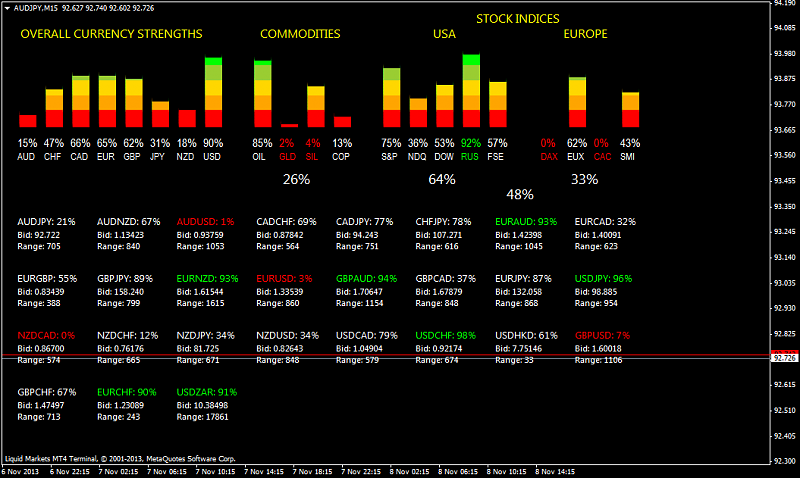 This current situation of currency index, comodity and stock index display by forex dashboard after NFP. Last edited by matfx; 11-08-2013 at 01:44 PM. 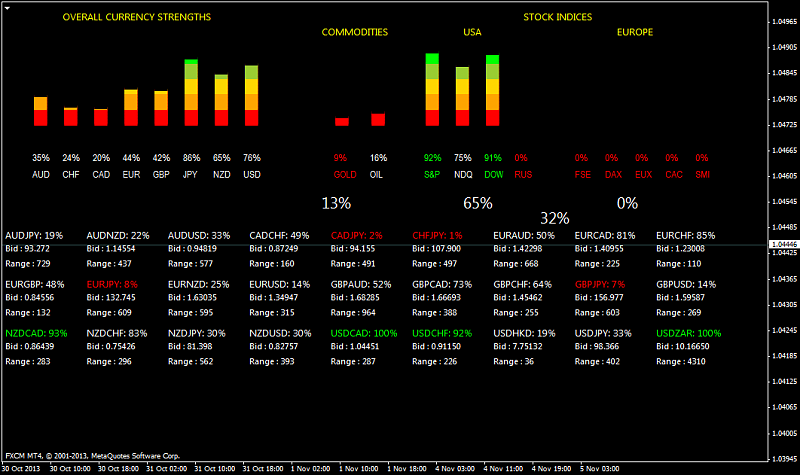 Show relative currency strength and suggest certain pairs which contain favourably matched strong/weak currencies. extern string	Currencies	= "EUR,USD,GBP,JPY,CHF,CAD,AUD,NZD"; //These are the currencies the indicator is measuring against one another. extern string	CurrDisplay	= "1,1,1,1,1,1,1,1"; //these relate to the above 8 currencies. If they are set to "1", the indicator will display information about that currency. If it is set to "0", the indicator will not display that particular currency. extern int	StrengthBase	= 60; //This is used for the line graph and the left hand bar chart and means the point in the past from which to measure the currencies strength. So if set to 60, the meter will calculate the percentage gains or losses for a currency compared to where it was 60 periods ago. extern int	LineChartBars	= 200; //the number of bars you can scroll back on the line chart indicator. Setting this too high can mean the indicator can look very narrow to compensate for the odd time when currency strength diverge to extreme distances. Last edited by levonisyas; 11-09-2013 at 11:52 AM. Thanks. I did a search, but couldn't find any formula for the AUD index. The early first one of the currency strenght indicators. But a little touch is added from my friend.